A 65-year-old male’s extensive oncologic history began in September 2009 when he presented with a T4N1M0 squamous cell carcinoma (SCC) of the right floor of mouth and hemimandible. The patient underwent a right segmental hemimandibulectomy, floor of mouth resection, right selective lymph node dissection, left fibular free-flap and postoperative radiotherapy to 60 Gy in 30 fractions to the primary site and superior ipsilateral neck. He tolerated this treatment well, but in September 2012 underwent segmental mandibulectomy with fibular free-flap reconstruction for osteoradionecrosis of the mandible. He was without evidence of disease until March 2013 when he developed firmness in the floor of mouth and was found to have a local recurrence of his disease on fine-needle aspiration. He subsequently underwent definitive surgical composite resection of his recurrent disease with segmental mandibulectomy, excision of the lip and floor of mouth, left selective lymph node dissection, right fibular free-flap reconstruction and tracheostomy. Unfortunately, approximately 7 months later, his disease recurred involving the entire hard palate. In January 2014, he underwent a right total maxillectomy with total palatectomy with wide local excision of the oral cavity recurrent tumor involving the right lower lip, buccal cavity, right lateral tongue and a right selective lymph node dissection. The pathology at this point was consistent with spindle cell carcinoma with bone invasion. In February 2015, the patient noticed increasing oral secretions and dysphagia. 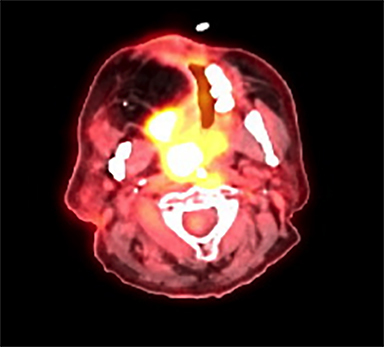 A positron emission tomography (PET) scan was performed demonstrating a hypermetabolic mass originating from the floor of mouth (Figure 1). 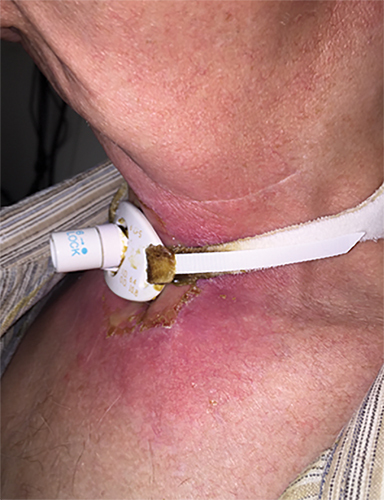 The patient underwent direct laryngoscopy with biopsies, which revealed recurrent squamous cell carcinoma with sarcomatoid features of the supraglottis and floor of mouth. Given his extensive surgical history and size of the recurrence, he was felt not to be a candidate for additional surgical resection. Due to the patient’s preference to avoid a protracted conventional treatment course, he and his wife opted to pursue a short-course of stereotactic body radiotherapy (SBRT). He was treated with SBRT to 45 Gy in 5 fractions to the gross disease (SBRT plan, Figure 2) delivered every other day. He tolerated this well and was found to have a complete response within the SBRT field at his 1-month follow-up visit. Unfortunately, however, a second asymptomatic, discontiguous exophytic, vascular parastomal recurrence was discovered within 1 month of completing SBRT in the paratracheal region inferior to the previous field (Figure 3). Given his previous excellent response, he again was treated with SBRT to 45 Gy in 5 fractions to the gross disease with an elective neck volume to 30 Gy in 5 fractions (SBRT plan 2, Figure 4). The second SBRT plan was assessed along with the first in a composite fashion to ensure there was no overlap (Figure 5). Again he tolerated this well with the exception of a brisk but focal moist desquamation of the parastomal skin (CTCAE v4.0 grade 3 radiation dermatitis). At his 1-month visit he was found to have a complete response without evidence of active disease (Figure 6). Unfortunately, at his 3-month follow-up, a recurrence within and superior to the original SBRT field was noted. He was felt not to be a candidate for further treatment and enrolled in hospice care. Approximately 3 months later he died at home. PET/CT was performed prior to the first course of SBRT and showed a new collection of increased metabolic activity (SUV 11.9) present in the right floor of the mouth extending posteriorly and inferiorly along the right oropharynx, measuring 11 × 4.5 cm concerning for recurrent neoplasm (Figure 1). Poorly differentiated recurrent squamous cell carcinoma with sarcomatoid features of the supraglottis and base of tongue. Locoregional recurrence is the most frequent pattern of failure in patients with head and neck cancer, with approximately 30% of patients developing locoregional failure within 5 years following cessation of multimodality treatment.1,2 While 50%-60% of patients will ultimately die as a consequence of locally recurrent disease,3 many locoregional recurrences are not immediately life-threatening, and patients who experience a confined recurrence can survive for months, suffering significant morbidity from progressive uncontrolled disease. Historical palliative radiotherapy regimens can temporarily improve quality of life and reduce the burden of symptoms in the majority of patients,4-7 but are not sufficiently aggressive to induce durable locoregional control. Here a case of multiple-recurrent head and neck cancer is presented. In this case, despite a radioresistant and aggressive sarcomatoid histology, durable local control was obtained with a short course of SBRT for nearly 6 months with minimal acute or late toxicity. For this reason, SBRT has emerged as an alternative treatment strategy for aggressive palliation of primary or recurrent head and neck tumors in patients who are not candidates for curative definitive therapy. The IMRT-based planning approach delivers highly conformal radiation in high doses per fraction, making this regimen both effective for patients requiring durable local control and convenient for patients with otherwise limited survival expectations when the goal of treatment is palliation.8 Several studies have demonstrated encouraging efficacy outcomes with modest toxicity profiles9-18 (Table 1). The University of Pittsburgh conducted a phase I dose escalation study to evaluate the safety and efficacy of SBRT for recurrent SCC of the head and neck. In a study of 25 patients, doses were escalated from 20 Gy in 5 fractions up to 44 Gy in 5 fractions, administered over 2 weeks. Only 4 patients experienced grade 1 or 2 acute toxicities, and no grade 3 or 4 dose-limiting toxicities occurred. Four objective responses were observed on PET/CT for an objective response rate of 17%. Median overall survival in the cohort was 6 months. The results led the authors to conclude that re-irradiation up to 44 Gy using SBRT is well-tolerated in the acute setting.16 Additionally, in a separate study, the authors found a relationship between higher doses, tumor volume and local control. Patients were stratified in to 4 dose groups: 15-28 Gy, 30-36 Gy, 40 Gy, and 44-50 Gy. SBRT dose and tumor volume were significant predictors of LRC, wherein doses ≥ 40 Gy, and tumors with GTV ≤ 25 cm3 were associated with increased LRC (p = 0.02 and 0 = 0.0001, respectively).19 The Pittsburgh experience using SBRT in this setting has expanded to include over 150 patients treated with doses of ≥ 40 Gy, with or without the use of concurrent targeted therapies such as cetuximab, with statistically significant improvement in various quality of life measures.20 Thus, SBRT to doses ≥ 44 Gy appears to be a feasible and efficacious treatment strategy, with a clear dose-response and tumor volume-response relationship. Additionally, treatment toxicity appears relatively mild. Other studies have further evaluated the role of concurrent targeted therapies with SBRT. In a recent prospective phase II trial examining SBRT plus cetuximab in patients with recurrent SCC of the head and neck, cetuximab improved tumor response rate compared to prior studies of SBRT alone.14 In this study, 50 patients received 40-45 Gy in 5 fractions on alternating days over 1-2 weeks. Locoregional progression-free survival as reported by the authors was 37%, with a 1-year overall survival of 40%, similar to conventional three-dimensional conformal and intensity-modulated radiotherapy (IMRT) controls. Acute and late grade 3 toxicity was minimal, each observed in 6% of patients, respectively. Thus, targeted therapies carry the potential to improve tumor response rates vs. SBRT alone with a tolerable toxicity profile, further making SBRT an attractive treatment option. The palliative benefit of SBRT was recently reported by Khan et al in an institutional experience investigating the efficacy of head and neck SBRT for symptom control in medically unfit or frail patients, including quality-of-life parameters pre- and post-SBRT. In this retrospective review, 21 elderly patients with de novo or recurrent tumors of the head and neck were treated with SBRT to a median dose of 40 Gy in 5 fractions with a complete response rate of 25% and a partial response rate of 67%. Quality of life was assessed using the European Organization of Research and Treatment of Cancer Quality of Life-Head and Neck module (EORTC QLQ-H&N35) questionnaire on the first day of treatment, and following the fifth treatment fraction, evaluating symptom-related items such as pain, swallowing, and taste. With lower scores correlating with better quality of life, pretreatment scores for the entire cohort were 53/130, with follow-up scores of 38/130, indicating a decrease in symptom burden following treatment with a trend toward statistical significance.18 Vargo et al similarly found that improved tumor control associated with SBRT treatment led to an increase in quality-of-life measures following SBRT re-irradiation in the recurrent setting.20 Taken together, these studies indicate that SBRT is an effective treatment strategy for symptom palliation leading to improved quality of life in both the de novo and recurrent tumor settings. It should be mentioned, however, that long-term late toxicity data is lacking. Our patient was treated for his recurrence using SBRT to a dose of 45 Gy in 5 fractions based on the prior studies mentioned demonstrating that doses > 44 Gy are safe and associated with increased LRC. Due to the regional parastomal failure inferior to the first SBRT volume, during the second course of SBRT a limited elective neck volume was added to a dose of 30 Gy in 5 fractions treated simultaneously. Although previous SBRT studies have not included an elective volume, this may serve to reduce the risk of marginal or regional recurrence. The dose of 30 Gy in 5 fractions is extrapolated from previous well-established regimens in the primary setting with conventional techniques.21 It should be noted that this regimen has not been established in the recurrent setting and further study is warranted. While this patient unfortunately failed within the first SBRT volume and has since died, SBRT treatment seemed to provide durable symptom palliation and minimal treatment toxicity, which likely would not have been accomplished with standard palliative techniques. The optimal role for SBRT in head and neck cancer is evolving and remains unclear. Considering that long-term “cure” is an unreasonable expectation for many patients with locoregionally recurrent disease, SBRT appears to be an excellent option for safe, durable and convenient aggressive palliation in patients at risk of long-term morbidity from locoregionally confined disease. Further investigation into the ideal dose, fractionation, target volume and concurrent therapies is needed. Bayman E, Prestwich RJ, Speight R, et al. Patterns of failure after intensity-modulated radiotherapy in head and neck squamous cell carcinoma using compartmental clinical target volume delineation. Clinical Oncol. 2014;26(10):636-642. Due AK, Vogelius IR, Aznar MC, et al. Recurrences after intensity modulated radiotherapy for head and neck squamous cell carcinoma more likely to originate from regions with high baseline [18F]-FDG uptake. Radiother Oncol. 2014;111(3):360-365. Hong WK, Bromer RH, Amato DA, et al. Patterns of relapse in locally advanced head and neck cancer patients who achieved complete remission after combined modality therapy. Cancer. 1985;56(6):1242-1245. Corry J, Peters LJ, Costa ID, et al. The ‘QUAD SHOT’--a phase II study of palliative radiotherapy for incurable head and neck cancer. Radiother Oncol. 2005;77(2):137-142. Paris KJ, Spanos WJ Jr., Lindberg RD, et al. Phase I-II study of multiple daily fractions for palliation of advanced head and neck malignancies. Int J Radiat Oncol Biol Phys. 1993;25(4):657-660. Chen AM, Vaughan A, Narayan S, Vijayakumar S. Palliative radiation therapy for head and neck cancer: toward an optimal fractionation scheme. Head & neck. 2008;30(12):1586-1591. Porceddu SV, Rosser B, Burmeister BH, et al. Hypofractionated radiotherapy for the palliation of advanced head and neck cancer in patients unsuitable for curative treatment--”Hypo Trial”. Radiother Oncol. 2007;85(3):456-462. Brown JM, Carlson DJ, Brenner DJ. The tumor radiobiology of SRS and SBRT: are more than the 5 Rs involved? Int J Radiat Oncol Biol Phys. 2014;88(2):254-262. Siddiqui F, Patel M, Khan M, et al. Stereotactic body radiation therapy for primary, recurrent, and metastatic tumors in the head-and-neck region. Int J Radiat Oncol Biol Phys. 2009;74(4):1047-1053. Roh KW, Jang JS, Kim MS, et al. Fractionated stereotactic radiotherapy as reirradiation for locally recurrent head and neck cancer. Int J Radiat Oncol Biol Phys. 2009;74(5):1348-1355. Unger KR, Lominska CE, Deeken JF, et al. Fractionated stereotactic radiosurgery for reirradiation of head-and-neck cancer. Int J Radiat Oncol Biol Phys. 2010;77(5):1411-1419. Kodani N, Yamazaki H, Tsubokura T, et al. Stereotactic body radiation therapy for head and neck tumor: disease control and morbidity outcomes. J Radiat Res. 2011;52(1):24-31. Comet B, Kramar A, Faivre-Pierret M, et al. Salvage stereotactic reirradiation with or without cetuximab for locally recurrent head-and-neck cancer: a feasibility study. Int J Radiat Oncol Biol Phys. 2012;84(1):203-209. Vargo JA, Heron DE, Ferris RL, et al. 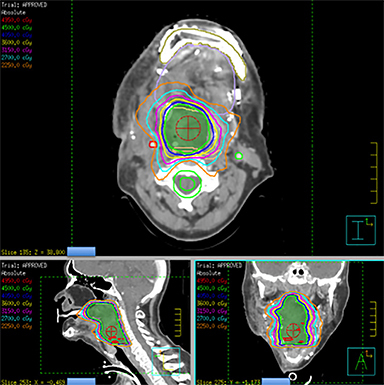 Examining tumor control and toxicity after stereotactic body radiotherapy in locally recurrent previously irradiated head and neck cancers: implications of treatment duration and tumor volume. Head Neck. 2014;36(9):1349-1355. Heron DE, Ferris RL, Karamouzis M, et al. Stereotactic body radiotherapy for recurrent squamous cell carcinoma of the head and neck: results of a phase I dose-escalation trial. Int J Radiat Oncol Biol Phys. 2009;75(5):1493-1500. Cengiz M, Ozyigit G, Yazici G, et al. Salvage reirradiaton with stereotactic body radiotherapy for locally recurrent head-and-neck tumors. Int J Radiat Oncol Biol Phys. 2011;81(1):104-109. Khan L, Tjong M, Raziee H, et al. Role of stereotactic body radiotherapy for symptom control in head and neck cancer patients. Support Care Cancer. 2015;23(4):1099-1103. Rwigema JC, Heron DE, Ferris RL, et al. The impact of tumor volume and radiotherapy dose on outcome in previously irradiated recurrent squamous cell carcinoma of the head and neck treated with stereotactic body radiation therapy. Am J Clin Oncol. 2011;34(4):372-379. Vargo JA, Heron DE, Ferris RL, et al. Prospective evaluation of patient-reported quality-of-life outcomes following SBRT +/- cetuximab for locally-recurrent, previously-irradiated head and neck cancer. Radiother Oncol. 2012;104(1):91-95. Ang KK, Peters LJ, Weber RS, et al. Postoperative radiotherapy for cutaneous melanoma of the head and neck region. Int J Radiat Oncol Biol Phys. 1994;30(4):795-798. Zakem SJ, Ward MC, Joshi N, Xia P, Koyfman SA. Stereotactic body radiotherapy for palliation of rapidly progressive locoregionally confined sarcomatoid squamous cell carcinoma. Appl Rad Oncol. 2015;4(4):20-24. Ms. Zakem is a Medical Student at Case Western Reserve School of Medicine, Cleveland, OH. Dr. Ward is Chief Resident, Dr. Joshi is Associate Staff Physician, Dr. Xia is Chief of Medical Physics, and Dr. Koyfman is Associate Staff Physician, all in the Department of Radiation Oncology, Cleveland Clinic, Cleveland, OH.